A timeless heroine, Alice is quick witted, determined, and resourceful. In her extraordinary adventures she meets a series of unforgettable characters, from the bossy White Rabbit to the grinning Cheshire-Cat and the mad Hatter, all of whom are as famous as Alice herself. 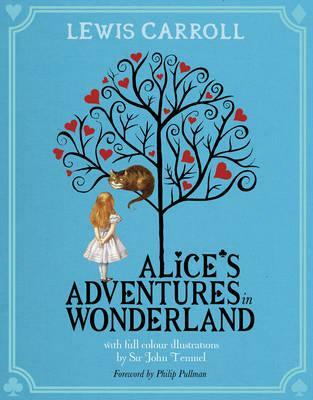 This gorgeous hardback gift edition includes Sir John Tenniel's much-loved illustrations with their original coloring which defines the authentic image of Alice as blond haired with blue stripy stockings. Lewis Carroll was the pseudonym of Charles Lutwidge Dodgson (1832–1898), a mathematician famous for his books for children. The Alice stories were written for Alice Liddell, the daughter of the dean of his college. Alice's Adventures in Wonderland (1865) and Through the Looking-Glass and What Alice Found There (1872) have been loved by adults and children ever since. Sir John Tenniel (1820–1914) was a Victorian topical cartoonist, caricaturist, and illustrator. Famous during his life for his contributions to the satirical magazine Punch, he is best remembered today for his work in Alice. Philip Pullman is the author of the Carnegie Medal-winning His Dark Materials trilogy. Philip Pullman is one of today's bestselling and most-loved writers for children. He is best known for the His Dark Materials trilogy.